Dieser Text finden Sie hier auf Finnisch, Schwedisch und Englisch. (1) Communication devices and special education are tightly knitted together. 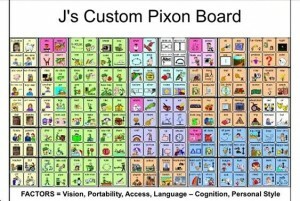 Communication devices ans special education are tightly knitted together. 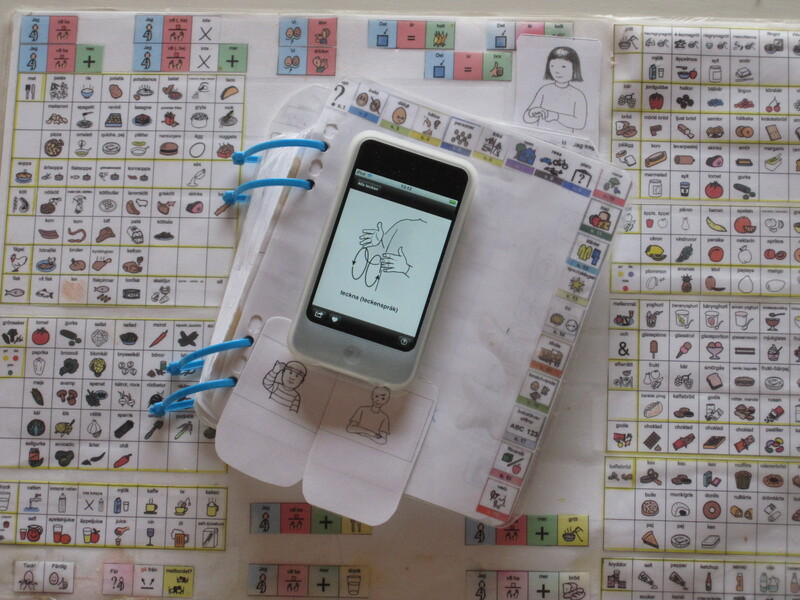 Communication aids and devices are needed, in plural, both as hi-tech and as lo-tech. You need several shoes and wheelchairs, why not several parallell AAC aids, too. Signs and symbols are planted into every school material. Communication and learning do not lead separate lives. 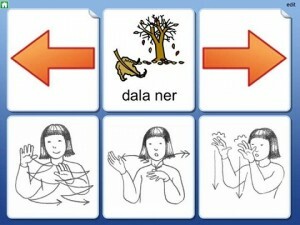 Please, make acquaintance with the method designed by Puheoikeus.fi:s, AAC Special Education©. We implant signs and symbols into all educational materials and we make school book substitutes for the non-talking, cognitively impaired pupils. The vocabularies of general knowledge, human rights, working life and handicap policy are programmed into all communication devices. We have hugely enhanced the productivity of special education through bridging the gap between AAC and special education. (2) If a person is able to pick his/her nose, a touch screen tablet or a mini tablet work well as a device. If a person is able to pick his/her nose, a touch screen tablet (iPad) or a mini tablet work well as a device. It is so much easier for many special kids to use a touch screen tablet than to turn pages in a book or a binder. The so called ”Big Communication Book” (Iso-AACi, Super-AACi) and the likes of it, typically ”preferred” (by the systems) in Finland and in Sweden, are (according to the evidence we have gathered) seen as veritable ”communication stoppers” (the communication stops abruptly due to the constant turning and quite clumsy turning of pages). These binders are disliked as the sole aid, but accepted in parallell to other means of AAC. Distant relatives might feel comfortable using the binders. Unfortunately, the binders are heavy and quite clumsy to carry. The heaviest weigh close to one kilogram. These do not work as the primary means for many people. They are also based on false assumptions and models. The communication and interaction are not synonymous with a thematic dictionary. Nor are they the same as speech using one word at a time from several, grammatical classes (nouns, verbs, pronouns etc) or using one context at a time while communicating. Contexts do support communication when all words needed are offered within the context. The downside lies in the words being repeated time after time. Thus, the binder grows and grows in size. When you have 150 contexts, no one finds the right one easily. It is hard to find the words in the present binders as they are delivered without a list of content. It is impossible to maintain the thought while building sentences. Not everyone is able to produce proper sentences. 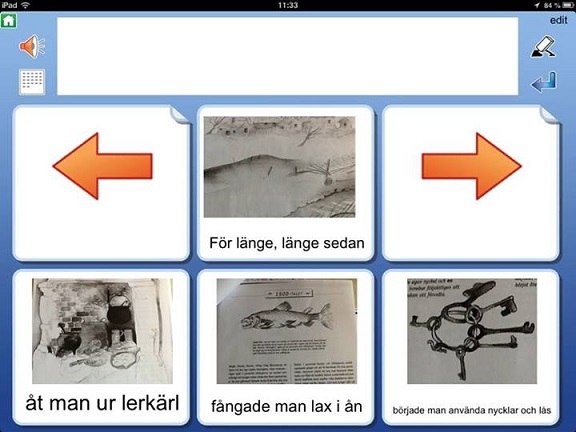 Using the binders, it is not easy to offer step-by-step learning, mainly due to a very limited vocabulary. The most important thing for a gravely speech impaired is not to have a perfect command of the linguistic structures. It is so much more important to have a real interaction and to get the voice heard. The binders tend to cement the children on a very elementary level with respect to the vocabulary. The user is denied access to words already known as these might not be included into the binders. The learning of new words is hindered. Neither the children nor the adults like binders like this. They seem to dislike PC-aids that require strenuous programing elsewhere, devices that seem to be relicts from times passed by, greetings from the ivory towers of outdated speech therapy. 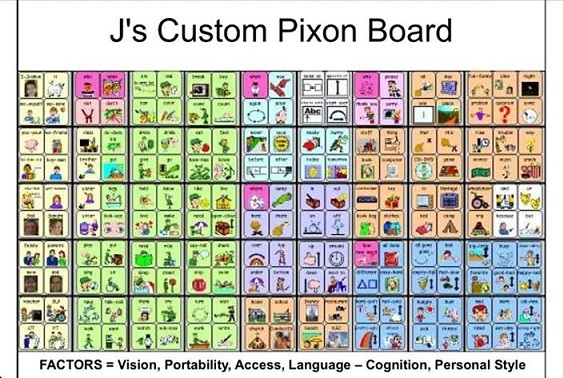 (3) The applications (”apps”), signs and AAC open a new world for individuals with a grave speech impairment, cognitive disability and/or autism. The applications (”apps”), signs and AAC open a new world for individuals with a grave speech impairment and/or autism. All of a sudden, one can advance from ”I want a banana” to discussions on and learning about anything from literature to klezmer – providing that general knowledge is programmed into the device. The programming is easy and convenient. One might program a whole context consisting of 100 words and sentences while wall climbing, during the breaks, in spite of being in charge of both belying and fixing a picnic. Both the teaching and the communication are enhanced and the levels of frustration and rage are diminished by the use of proper communication apps. Normally, outbursts are provoked by our faults in the communication and/or our ignorance with regards to the use of visual messages. It is a part of the human rights of the disabled person and completely within our interest not to punish or to medicate the wrong persons on the wrong grounds. (4) The choice of communicative aids depends on the needs, the use and the commitment of the user. The choice of communicative aids depends on the needs, the use and the commitment of the user, not on rationing both words and devices. The touch screen tablets (iPads) cost only a tenth of the costs of the more traditional, monopolistically priced devices, while they offer ten times more of benefits. Why are Ipads, then, so seldom recommended? Often, the motivation is ”they cannot use them”. In other cases, the reason is that the ”iPad is a consumer good”. For some reason, the feedback from the users does not reach the ”competence units”. There is a lot of proof from reality of successful and intuitive use of iPads in communication. For some reasons, the differens units tend to work with the wrong things, often in parallell and competing with another, leaving huge ”holes” between the actors. We do the same things in several places, we do the wrong things, but we do ration with fervor. According to our experience and view, the families do want only the things they are really commited to. They do not use aids that they dislike. Nor do they use things that the surrounding world neglects. 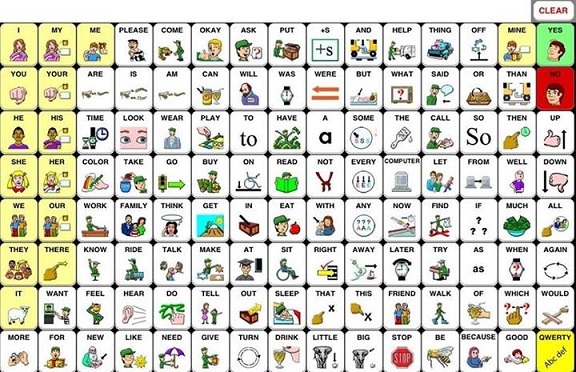 (5) The Core Vocabulary is the basis for all communication, irrespective of the context. The Core Vocabulary is the basis for all communication, irrespective of the context. 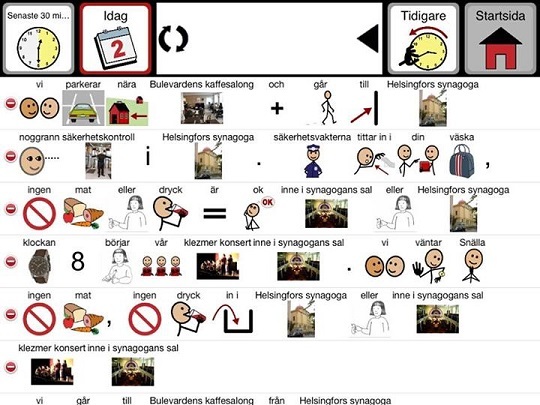 All communication devices should have a core vocabulary as a basis. The 100-500 most commomly used words of a language form the core vocabulary. Only after that, should there be links to contexts, themes, phrases, conjugation and, possibly, to linguistic structures (grammar). It is of utmost importance for the user to be able to take part in any discussion, irrespective of the subject or the physical/geographical setting. The core vocabulary is needed. When one wants to broaden the discussion, one clicks further into the application. We do not start discussions via the use of grammatical classes. It would not occur to our minds to build a communication app based solely on grammar, at least not for special kids thar do not master the linguistic structures. Why, then, do we make apps and other aids based on nouns, verbs and the ”residual” called ”short words”? In our experience, the aid centres, seem to take to just this. Please, make acquaintance with the following actors: Prentke & Römich (expensive, but well functioning PC-materiala) and the app ”Speak for Yourself” ($200, one zero less then the PC-materials), lectures ans materials byGail van Tatenhoven and PrAACtical AAC and with proof for how well the core vocabulary works. 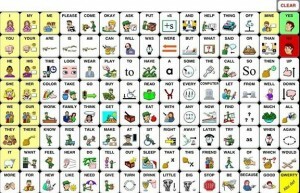 When prompting (obtaining a model for the use of the device and of the core vocabulary), the use of Aided Language Input (ALI) is to be used. It is the work done after buying he device, that matters. We do need long-term and sompetent input here, in the form of consultation and tutoring. The assessment and the tests should take less time than the support for the implementation and the enlarged use of the device. All our energy is needed here. We need to prompt at least 20 times an hour during the whole day, not during separate ”communication hours”. And, this only secures the same amount of input as any kid would get. Still, we are not talking about extra support. The kids need not prove their skills prior to testing different devices. Unfortunately, we do ration both words and devices and we do force them to begin with the use of too simple devices as steps on the way to what they really appreciate. We force obstacles upon the kids and their communication. Using the same logic, we should be forced to make group accounts befora getting to see an Excel demo or drive around in a car before attennding driving lessons. It is the wrong way round. We should, as we do with talking kids, prompt and expand both the use of words and the expressive language, at least 20 times an hour in order to offer the special child the same amount of input as any other kid gets. (6) Do not limit the vocabulary. Do not limit or ration the vocabulary. The choice of communication aid is not based on the existing vocabulary or on the experience of the use of a certain gadget. The user needs a lagre vocabulary and a possibility to prove linguistic skills that the adults possibly do not know that the kid knows as the aids generally consist of a very limited vocabulary. The user needs to learn from others, by seeing good examples of the use of aids and of communication. We do not say to ”normal” kids that they have to wait for Grade 7 before us using certain, common words. Why do we limit the access to words for special kids who have problems in their communication? Normally, we deliberately expand the (heard, passive) vocabulary of small babies. Why, then, is the equivalent ”medically” forbidden in relation to special kids? (7) All words related to school subjects, all work related words and anything we might derive from UN Enable (the Human Rights for the Disabled) is included into the vocabulary. All words related to school subjects, all work related words and anything we might derive from UN Enable (the Human Rights for the Disabled) is included into the vocabulary. All subjects are programmed into the communication app. The communication and education cannot lead separate lives. The child only has one life. All themes of the education plans and of knowledge in general are to be found in all of the communication devices offered. That means that there should be themes, words, signs and symbols covering life in general and academica. Of course, films and photos are included. We strongly urge everyone to add both contexts and all possible vocabulary needed related to human rights, abuse and wrongdoings into the aid. It is important to be able to tell about wrongdoings and it is of utmost importance not to medicate or discipline the wrong person, thus imposing a furhter wrongdoing on the individual – for our communication faults. (8) Specialists are needed for securing the implementation and for a long-term consultation aimed at a broader use of the communication aid. Specialists are needed for securing the implementation and for a long-term consultation aimed at a borader use of the communication aid. Today, too much time is spent on assessments, on rationing and on obsolete materials in relation to the time used on the implementation. Coaching is easily neglected. Why not turn the ”beef” and get fast access to the device and then using all our effort, time and energy on a dedicated and veritable communication offensive. The assessment and the purchase form only a tiny bit of the whole process. We should use our muscles on the implementation and on expanding the use of AAC devices. To the right, you can see how prompting is done. We discuss it further in paragraph (9). We can and should discuss things with the pupil simply by pressing individual buttons. We do not need complete sentences in the beginning. We also need to prompt the use of deeper layers, ie. the expanded vocabulary, conjugation etc within the application, the use of contexts and, especielly in the beginning, the use and introduction of new words, preferably showing many examples thereof. 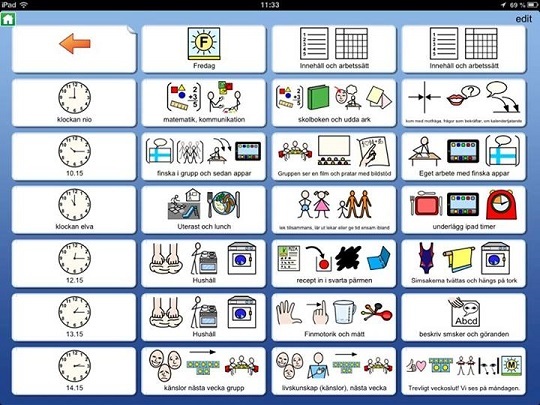 (9) Our role is to model (prompt) the use of AAC at least 20 times an hour. 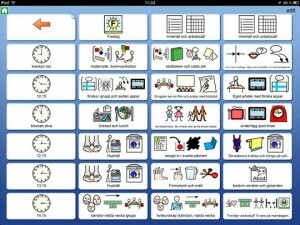 Our role is to model (prompt) the use of AAC at least 20 times an hour. The gap between the so called ”normal” kids and the special kids/the weak communicators tends to increase daily as we do not interact with the latter as we do with the former. Autistic kids tend to live in a silent surrounding, too. For some reason, the adults become silent in the presence of autistic persons. The adults even seem to wait for initiatives from the part of the autistic individual. We do not initiate the use of signs. Or, we make random use of communication devices – mostly when we feel the need ourselves. A so called normal child gets 4,400 hours of linguistic input by the age of 18 months if we talk to her/him for 8 hours per day. Special kids tend to get only some 10 minutes linguistic input a day. Following that pace, the child has to be 84 years old in order to get as much of linguistic input as a baby gets! (10) Learn more through gathering feedback from the users and by letting the users lead the product development processes. Learn more through gathering feedback from the users and by letting the users lead the product development processes. Gather information and feedback. Let the users head the activities in new directions. Your role is to focus on the financing/funding and on the implementation. The user needs to feel that the aid units and specialists are able to affect society where there is shortage of funding, of competencies or of appropriate services. Make noice, jujump onto the barricades if you lack the prerequisites for proper aid or if you feel that the AAC users are left completely on their own. Go to your boss (at least in Scandinavia) urging for assistance, offering suggestions for improvement. Write articles and debate articles and write to decision makers and politicians. The well-being of your clients, pupils, patients is (partially) your responsibility. Set up meetings between different actors and do not let anyone leave the room until you have found a solution and landed on an action plan. A clusure, a shutdown or redundancy plans are not an option for the target group that does not get its voice heard anyway, today. Ask us for help. With the word ”us” we refer to the experience and the expertise of Puheoikeus.fi (Finland, Scandinavia) and to other actors presently developing the areas of signs, AAC and special education. In short: specialists need to merge these activities into one. That is the reason why we developed the way of thinking and a methodology called AAC Special Education©. 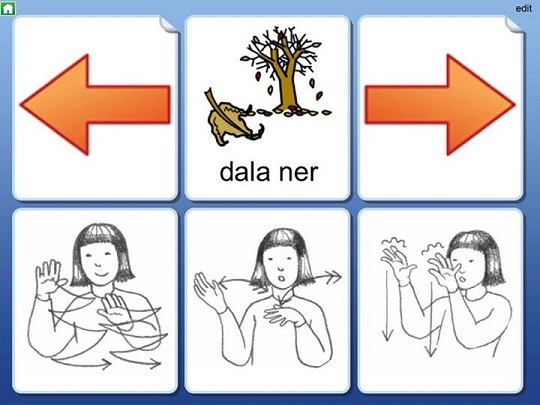 (CAA éducation specialisée©, UK Sonderpädagogik©, AKK-specialpedagogik©, AAC-erityispedagogiikka©). 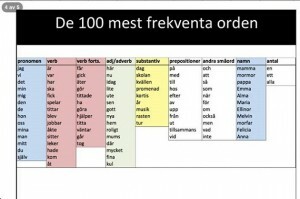 Please, google to find the 100 most common words in your own language. 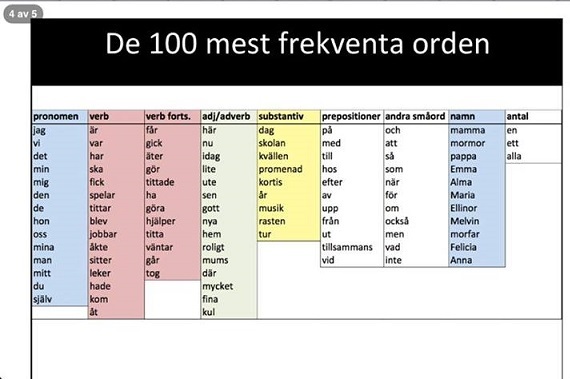 Enclosed, you see the 100 most common kindergarten words in Swedish, including some names. Irrspective of you starting with 100 or with 500 core words, it is worth the effort to start there. That applies for all attempts to study foreign languages, too. Organised common sense? Contact us for an update or for questioning the ways we generally work in today. Speak for Yourself (figure 6), Prentke-Römich (5a), Gail van Tatenhoven (5a), PrAACtical AAC, DART (10b), One Kids Place/La Place des Enfants (8, 9), Puheoikeus.fi (1a, 10B Hit the Papers) and Terry Grahn (1b, 2, 3, 5b, 7, 10a).